Daniel Aaron, a refugee from Nazi Germany and an orphan who went on to become a founder of Comcast, the largest cable company in the country, died last Thursday [02/20/2003] in Philadelphia, where he lived. He was 77. The cause was Parkinson's disease, according to the company. In 1963, Mr. Aaron persuaded Ralph J. Roberts, a Philadelphia entrepreneur who had recently sold a men's wear business, to buy a small cable television system in Tupelo, Miss. As part of the deal, Mr. Aaron agreed to help run it, and over the next 30 years they built or acquired dozens of other cable systems around the country. Last fall, the company they started, Comcast, acquired AT&T Broadband to become the largest cable television service provider in the country. In 1990, speaking at a dinner for his retirement as vice chairman of Comcast in Philadelphia, Mr. Aaron described himself as something like the conscience of the operation. He pictured the young company as a car, with Mr. Roberts, the chairman, behind the wheel, Julian A. Brodsky, the principal fund-raiser, stepping on the gas, and Mr. Aaron himself with a foot on the brake. For a tenacious businessman, Mr. Aaron professed to unusually liberal political convictions, which some of his colleagues said bordered on socialist. Mr. Aaron's strong cautious approach to business and liberal political impulses may have grown out of the painful circumstances of his youth. He was born in 1926 in Giessen, Germany, near Frankfurt, the son of a prominent lawyer and Social Democratic politician who was also a Jew. In 1937, when Mr. Aaron was 10 years old, his father was briefly imprisoned by Nazi authorities but narrowly managed to escape with the family shortly before Kristallnacht. The family emigrated to Kew Gardens, Queens, but starting anew proved too much for the parents. In 1939, when Mr. Aaron was at summer camp at 13, his mother committed suicide. Three weeks later, his father killed himself as well. In his memoirs, "Take the Measure of the Man" (Veritas Press, 2001), Mr. Aaron recalls that he never learned the means of their deaths. "Perhaps I didn't really want to know." In 1944, Mr. Aaron was not yet a citizen but old enough to be drafted, and he returned to Germany with the army, in time to witness the liberation of slave laborers. After the war, he attended Temple University, where he met his wife, Geraldine. She still lives in Philadelphia. Mr. Aaron is also survived by his younger brother, Frank Aaron of Dallas, as well as five children: Erika Aaron and Judson Aaron of Philadelphia; James Aaron of Dallas; Kenneth Aaron of Holland, Pa.; and Alison Aaron of Edison, N.J.
Mr. Aaron started his career as a business journalist for the Evening Bulletin, a Philadelphia newspaper, which was where he first encountered the fledgling cable business. He wrote an article about Milton Shapp, founder of Jerrold Electronics, one of the first cable companies to deliver better TV reception. Mr. Aaron was impressed that Mr. Schapp employed an executive who had been physically handicapped by polio and "made it work," as Mr. Aaron recalled in his memoir. Mr. Aaron signed on to the company the next year to handle public relations. When Mr. Schapp successfully ran for governor of Pennsylvania in 1970, Mr. Aaron struck out on his own. He became an informal broker selling cable systems, which introduced him to Mr. Roberts. In 1980, Mr. Aaron began feeling the onset of Parkinson's disease, which lead to his retirement a decade later. Brian L. Roberts, the son of Ralph Roberts and now president of Comcast, said that Mr. Aaron sought to fight the disease by taking up yoga and tap dancing. In 2000, Mr. Aaron founded the Dan Aaron Parkinson's Rehabilitation Center, to provide education, counseling and physical therapy to other people with the disease who are less able to afford it. SCTE mourns the loss of one its most prolific members, Mr. Wendell Bailey, who passed away September 26, 2006 from cancer. Mr. Bailey was one of only a handful of SCTE members to attain SCTE Fellow Member status. He resided in Fort Washington, Maryland, and most recently was CEO of Strategic Technology International. He was an SCTE member since 1979, and he served on the SCTE Board of Directors. Mr. Bailey was a former vice president, science and technology, with the National Cable & Telecommunications Association (NCTA). NCTA's William Check called him "a great unifying force in our industry" and "a global ambassador for the U.S. cable industry." Published in SCTE Interval, November 2006, p. 2. N. Lawrence (Larry) Bentson died of cancer Sunday [04/12/2009] at United Hospital in St. Paul. He was 87. Bentson made his radio debut at age 12, when he starred in a children's show broadcast on Twin Cities airwaves. He was paid $1 and given two streetcar tokens per episode. That was the start of a 75-year career in the broadcasting, entertainment and communications industries. Bentson was instrumental in putting WMIN-TV Channel 11 (now KARE-TV) on the air in September 1953 and joined with his father-in-law, Eddie Ruben, and Joe Floyd to found what is now Midcontinent Media, a company that provides cable television, digital telephone and broadband Internet service in Minnesota, North Dakota and South Dakota. Bentson was also a major philanthropist in the Twin Cities, where he donated to many nonprofit organizations and created scholarships and fellowships at his alma mater, the University of Minnesota. He was chairman of the board and the last remaining founding partner of Midcontinent, which in 1952 acquired a Sioux Falls radio station and built the first TV station in South Dakota. Under his leadership, the company acquired several radio and TV stations in Wisconsin and Minnesota, including KDWB and WLOL 99.5 FM (now KSJN-FM). The company entered the cable TV industry in the 1960s and subsequently expanded into broadband Internet and telephone service. "Larry was a pioneer in the cable industry and was always trying to improve conditions for our customers," said Tom Simmons, Midcontinent's senior vice president of public policy. "He was a visionary. He had a remarkable career and was gracious about giving back to the industry, both with time and money." Bentson was honored last year with the Ward L. Quaal Broadcast Pioneer Award from the Broadcasters Foundation of America. He was inducted as an inaugural member of the Museum of Broadcasting Hall of Fame in 2001 and was a past president of the Minnesota Broadcasters Association. Bentson was born in Lidgerwood, N.D., and graduated from St. Paul Central High School. He earned a degree in engineering from the University of Minnesota. He spent three years as a lieutenant in the Navy during World War II. Bentson is survived by his second wife, Barbara Braman Bentson of St. Paul; a daughter, Laurie Kauth of Santa Barbara, Calif.; a stepson, Tom, of St. Paul, and a granddaughter. He was preceded in death by his first wife, Nancy Ruben Bentson, and a daughter, Jan Bentson Martin. Services will be held at 2 p.m. today at Mount Zion Temple, 1300 Summit Av., St. Paul, Minnesota. By Tim Harlow. Published in the Minneapolis Star Tribune, 04/15/2009. Isaac S. Blonder, 92, husband, father, inventor, businessman, and technology visionary, died on August 29, 2008 after a long and productive life. Mr. Blonder was born in New York City on June 24, 1916, and grew up in an apartment over his family's garage and gas station in New London, Connecticut. One of five children of immigrants from Russia, "Ike" developed his early engineering skills wandering among junked cars, a blacksmith forge and his mother's egg-laying hens. He was the first in his family to attend college and was the University of Connecticut's first engineering physics major, graduating in 1938. Mr. Blonder went on to receive a masters in science from Cornell University. Mr. Blonder entered the army in early 1941 as a member of the Electronic Training Group. As part of a secret clause in the lend-lease agreement between Roosevelt and Churchill, the ETG was sent to England before Pearl Harbor to operate classified radar installations under the auspices of the British government. After the war he gravitated to the burgeoning field of electronics engineering and in 1950, with friend and fellow engineer, Ben Tongue, founded New Jersey-based Blonder-Tongue Laboratories. They manufactured television cameras, monitors, cable television equipment, and other products related to the television industry. Under their leadership, Blonder-Tongue Labs created jobs for more than 200 people for 39 years, an accomplishment that Mr. Blonder was as proud of as his 39 patents. Mr. Blonder had a long history of pioneering innovations. A dispute over one key invention, the asymmetric log-periodic television antenna, made it to the Supreme Court where Blonder-Tongue prevailed and established a key legal precedent on collateral estoppel. Beyond his many products serving the cable TV industry, Mr. Blonder created the first successful Spanish-language television station in the country. Later, fascinated with 3-D technology, he launched an experimental 3-D TV channel in conjunction with Stevens Institute of Technology. Mr. Blonder was also the first to invent a pay-per-view system for cable television. In 2002 Mr. Blonder and Mr. Tongue were inducted into the New Jersey Inventors Hall of Fame. In the 1970's, along with Robert Rines (a wartime friend and B-T patent attorney), he joined the Academy of Applied Sciences which sponsored many expeditions to Loch Ness using sonar, underwater photography and pheromones. Soon Loch Ness became an annual family pilgrimage and Mr. Blonder's preferred "vacation." The team did capture underwater photos of a large, moving body--the presence of which was corroborated by sonar readings. He was married to Lois Blonder for 46 years, with whom he had three children Greg, Brad, and Terry. Until her death in 1999, Lois, an artist, broadened his world with art, theater, travel, and stimulating conversation. Mr. Blonder leaves two children, four grandchildren and three siblings--Bertha Lee Krantz, Esther Lobel and David Blonder, all of Florida. Donations in Isaac Blonder's name can be made to The Cable Center. Published on the Blonder-Tongue website (accessed 11/15/2008). Bill Bresnan, cable pioneer and founder and chairman of Bresnan Communications, died November 27, 2009 in his home in Greenwich, succumbing to a bout with cancer. He was 75. Born in Mankato, Minn., Bresnan began his cable career in 1958, when at 25 he designed and built his first cable system in Rochester, Minn. When that system was acquired by entrepreneur Jack Kent Cooke in 1965, Bresnan joined Cooke, whose holdings were ultimately merged with TelePrompTer Corp. Bresnan served as president of TelePrompTer's cable television division from 1974 to 1981, when Westinghouse Electric purchased the company and Bresnan was named chairman and CEO of the new company, Group W Cable, Inc. Three year later, he founded Bresnan Communications, a company which initially operated cable systems both in the upper midwest and internationally and which today serves some 320,000 subscribers in Colorado, Montana, Wyoming and Utah. "Bill Bresnan hired good, smart people and lead by example," said Bresnan Communications CEO Jeff DeMond. "He gave us the mission to succeed not just by doing things right, but by doing the right thing as well, and each of our lives is richer for having learned from him." Noted industry pioneer Alan Gerry: "Bill has left a giant void in the lives of all of us who knew him. A modest man with a heart of gold walked among us during the many decades that he devoted to building his various cable television pursuits and the many legislative hurdles he overcame to become one of the true leaders and entrepreneurs of the cable television industry. Sandra and I express our deepest condolences to Bill's wife Ann and their loving family." Throughout his career, Mr. Bresnan played a leadership role in the cable television industry, via participation in industry associations, and having testified before the Federal Communications Commission and U.S. Congressional committees on a wide range of communications and copyright issues. Known as one of the cable industry's leading contributors to technological advancement, he played a major role in the development of the first domestic satellite transmission, as well as the country's first commercial fiber optic communications system. He was the recipient of virtually every award and recognition within the cable industry and was inducted into both the Cable Television Hall of Fame and the Broadcasting & Cable Hall of Fame. Bresnan served for over 35 years on the board of directors of the National Cable & Telecommunications Association, and was a member of board of The Cable Center in Denver since its inception. His legacy also extends to roles as chairman of the executive committee and a member C-SPAN's board, a board member of Cable Television Laboratories and the Cable TV Pioneers. A supporter of diversity in the workplace, he was also a member of the board of The Emma Bowen Foundation and an honorary lifetime member of Women in Cable and Telecommunications. He previously served on the boards of Cable in the Classroom and the Cabletelevision Advertising Bureau. It is an especially sad day for us members of the board of directors where Bill served as our Member-Emeritus and gave so generously of his time to ensure the continued success of The Cable Center in Denver. Bill Bresnan will always be a legend in our industry. By Lisa Turner. Rex Porter. Published on Cabletv-list on 11/30/2009. Richard G. Covell, 81, passed away due to complications from lung cancer on Tuesday, August 16, 2016 with his family by his side. Richard was born in Brooklyn, NY as the only child of Ione Marie Lolan Covell and Gerald Ralph Covell onFebruary 16, 1935. His family moved to Westfield, NJ where he grew up and later graduated from Westfield HighSchool in 1953. In January, 1955 Richard enlisted in the Navy and was immediately deployed to the Korean War aboard the U.S.S. Wisconsin as Interior Communications, Third Class Petty Officer. He was honorably discharged two years later, remaining in the Reserves through 1961. He was proud of his Navy service. After high school, Richard worked for the Radio Corporation of America (RCA) in electronics and resumed that jobafter the Navy. He attended the Newark College of Engineering in Newark, NJ and later Seton Hall University in Newark, NJ while he worked. Richard became both a pioneer and legend of the broadband telecommunications network and his workimproved the lives of millions. He was instrumental in the transformation of the four-channel television era into aworld of news, current events, entertainment and more. He was recognized by the Society of Cable Television Engineers (SCTE) for his vision and extraordinary efforts including the following accomplishments; named a Cable TV Pioneer in 2002; Emeritus Member of SCTE; Member of the SCTE Circle of Eagles; 1990 Member ofthe Year; and 1998 Hall of Fame inductee. Richard served as Director of the Rocky Mountain SCTE Chapter; National SCTE Director at Large; and Western Vice President, SCTE. Richard also was a member of the Advisory Board of the Communications Technology Magazine. He received the President Award for Outstanding Performance from Jerrold Communications. Continued here. By Lisa Turner. Published on Cabletv-list on 08/25/2016. Bill Daniels, a pioneer of the cable television industry, died Tuesday at a hospital in Rancho Mirage, Calif. He was 79. The cause of death was respiratory failure, said Dan Russo, a spokesman with Daniels & Associates in Denver. Mr. Daniels, who lived the last few years in Del Mar, Calif., built what he called a CATV, or community antenna television, system in Casper, Wyo., and Rawlings, Wyo., in 1952. It served communities otherwise unable to receive television because the broadcast stations were too far away or their signals were blocked by mountain ranges. While the Wyoming venture was not the first cable system in the nation, it was the first to relay a broadcast signal using microwave technology. He then developed several other cable systems, and in 1958 he founded Daniels & Associates, a cable television brokerage firm and investment bank. Mr. Daniels not only served rural residents with cable broadcasts but also provided programming that was exclusive to cable networks, so that they could compete in areas already served by broadcast television. He eventually owned hundreds of cable systems throughout the nation but sold them or merged them with United Artists Communications in the 1980's. In 1985, Mr. Daniels started Prime Ticket Network with the owner of the Los Angeles Lakers, Jerry Buss; he sold the network in 1994 to Tele-Communications Inc. The network later became part of Fox Sports. He also owned a basketball team in Salt Lake City; held a part-interest in the Los Angeles Lakers basketball team; founded the United States Football League, which is now defunct, and managed the career of the heavyweight boxer Ron Lyle. He sponsored a car at the Indianapolis 500 and in 1996 set a world speed record for business jets; his four-man crew piloted a Learjet around the globe, making nine refueling stops, at an average ground speed of 463.5 miles an hour. In 1974, Mr. Daniels ran unsuccessfully for the Republican gubernatorial nomination in Colorado. He was chosen in 1991 by Broadcasting magazine as one of the first 60 inductees into the Broadcasting Hall of Fame and in 1992 he was given a special Emmy Award from the National Academy of Television Arts and Sciences. His philanthropy included a $22 million gift to the University of Denver; the college of business there is named after him. In January, he pledged most of his $1.1 billion estate to send thousands of underprivileged students to college. He donated his $7 million mansion, called Cableland, to the City of Denver to use as a mayoral residence. Born on July 1, 1920, in Greeley, Colo., Mr. Daniels was graduated from the New Mexico Military Institute. He served in the Navy as a fighter pilot during World War II and the Korean War. Published in The New York Times on March 9, 2000, on page B15 of the New York edition. Robert Van Cleft Dickinson of Zionsville, PA passed away on Wednesday, May 28, 2008 at the age of 79. He was born in East Orange, NJ to Edwin A. and Doris V. Dickinson. Bob earned his undergraduate and graduate degrees from Stevens Institute of Technology. He was a Fellow of the Society of Cable Telecommunications Engineers, member of the IEEE, and served on many industry standards committees. He held numerous patents and operated his own research and development company. He enjoyed world travel, hunting, fishing, flying airplanes and amateur radio. He was an active member of the Reformed Baptist Church of Franconia, PA. He is survived by his wife Jessie, of 56 years, and four children - Edwin Dickinson, Patricia Schuessler, Martha Dickinson and Sarah Polek, five grandchildren and three great-grandchildren. In lieu of flowers, memorial donations may be made to Trans World Radio, P.O. Box 8700, Cary, NC 27512. Published in the [Allentown, Pennsylvania] Morning Call on 6/3/2008. Robert Van Cleft Dickinson, W3HJ (ex-W2CCE), of Zionsville, Pennsylvania, passed away May 28. He was 79. A Fellow of the Society of Cable Telecommunications Engineers and a member of the IEEE, Dickinson, a long-time ARRL Technical Advisor, wrote the chapter on cable television interference in the second edition of The ARRL RFI Book. ARRL Lab Manager Ed Hare, W1RFI, remembered Dickinson, saying, "In the early 1980s, as the cable industry was developing, the relationship between the cable industry and Amateur Radio was not good. Early systems were leaky and interference problems -- especially on 2 meters -- were common. Dickinson helped change that; he agreed to serve as a liaison between the ARRL and the National Cable & Telecommunications Association (NCTA). It took years, but over time -- as improvements in the construction of cable plants and firm guidance from NCTA to cable operators who did not promptly correct interference problems -- his work helped the cable industry flourish with good coexistence with licensed radio services. This has served as a model for ARRL's relationship with other industries." ARRL Chief Development Officer Mary Hobart, K1MMH, echoed Hare's thoughts: "We are saddened by the loss of Bob Dickinson, W3HJ, a good friend of ARRL and Amateur Radio. Bob's keen interest in League activities on behalf of our Service was evidenced by his generosity as part of the ARRL Diamond Club for five years, as well as his financial support of the Spectrum Defense Fund and the Education & Technology Fund." Dickinson is survived by his wife Jessie, four children, five grandchildren and three great-grandchildren. Published on the ARRL website (accessed 07/05/2009). Earl Edwin Gilbert, 90, of Scottsdale passed away peacefully on January 25, 2009. He was born October 31st, 1918 in Davenport, Iowa. Earl will be missed by his beloved wife Jan of 19years, sister Betty Ball, daughter Star Scurr and her husband Chuck, son Lanny Gilbert and daughter in law, Janet, six grandchildren and seven great grandchildren. Earl graduated from Davenport High School in 1937. He was a World War II Army veteran and participated in the Battle of the Bulge. He moved to Arizona in 1952 where he owned and operated Gizmo's Drive-Ins, Gilbert Engineering and Pyramid Industries. His former company, Gilbert Engineering, now called CorningGilbert, just celebrated its 50th Anniversary in 2008. Earl invented and produced the first cable television connector. He was a charter member of Phoenix Firebird Lions Club, a member of the Masonic Trinity Lodge No. 208, and El Zaribah Shrine. Funeral services will be 11:00 AM Monday February 2nd at Messinger Mortuary, 7601 E Indian School Road, Scottsdale followed by interment at the National Memorial Cemetery of Arizona, 23029 N Cave Creek Road, Phoenix, AZ. Memorial contributions may be made to the Lions Club, the VA or Shriner's Hospital. 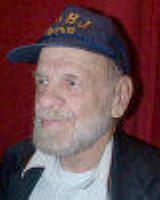 Philip D. Hamlin died January 25, 2014 at his home in Normandy Park, Washington at age 96. His death was attributed to homicide by a caregiver. A West Seattle native, Mr. Hamlin was a pioneer of the cable television industry. In 1949 he installed one of the world's first cable systems on Beach Drive in the Alki District. He went on to wire Lake Washington Blvd. and several other Seattle areas after obtaining the world's first municipal franchise from the City of Seattle. Mr. Hamlin's graduated from West Seattle High School and briefly attended Whitman College before being invited to leave. His affinity for electronics started with World War II, where in five years of active duty he rose from Private to Major while working in Radio and Radar Research. After the war he worked briefly in communications engineering for General Electric before his involvement in cable development. Eighteen years after putting in the first Seattle area cable system, Mr. Hamlin again applied for and won a new franchise for the area of Seattle's Capitol Hill. But Mr. Hamlin's most lasting contribution to cable television was the invention of the "cable convertor". Old friends from his cable days asked him to design a "channel expander" to increase a TV set's capacity over the existing 12 channels and to overcome certain signal deficiencies. Hamlin designed the box to operate with a "slide switch"; the ubiquitous box and its successor designs became a fixture and still control both channel selection and Pay TV delivery in millions of homes throughout North America. In his later years, Mr. Hamlin enjoyed traveling around the country with his beloved wife Millie in their custom motor home. Editor's note: the Old CATV Equipment Museum holds several Hamlin converters in its collection. Photos and descriptions are available here. Obituary published in The Seattle Times on February 4 and 5, 2014. The Rev. Dr. Luther D. Holt, 88, of Mahanoy City, died Sunday [July 31, 2005] at Shenandoah Manor, Shenandoah. Born in Mahanoy City in 1916, he was a son of the late Charles and Margaret Gilfert Holt. He was a self-employed electronics engineer and former owner and operator of Holt Electronics in Mahanoy City. In 1948, he established an electronics school, known as American Radio School, at his electronics shop in Mahanoy City. He was one of the first pioneers in the new field of cable television. He worked closely with John Walson, Sr. during the design and construction of Walson's cable TV systems in Mahanoy City and other cities. In the early 1960s, he purchased and remodeled the the Victoria Theater in Mahanoy City, where he presented several big-name entertainers. Holt also served as pastor of the Salem Evangelical-Congregational Church in Mahanoy City and as a member of the Board of Directors of the Schuylkill Technology Center. He was loved and respected by all those who knew him, including his family, friends and congregation. Funeral services will be held at Jane Clifford Ritz Funeral Home in Mahanoy City, with The Rev. William Fetrow officiating. Published in the Pottsville, Pennsylvania Republican on August 2, 2005. Additional text by Neal McLain based on information provided by H. Antoinette Hilmer. Photo courtesy of H. Antoinette Hilmer. 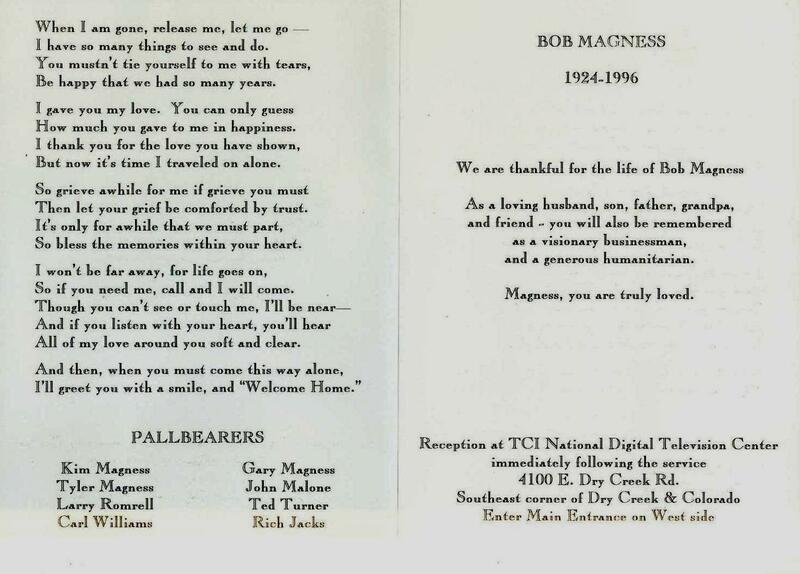 Bob Magness was born in Clinton, Oklahoma in 1924. Following a tour of duty in the service, he attended Southwestern Oklahoma State University, and received a Business Administration degree in 1946 and subsequently became a cotton seed salesman and cattle rancher. In 1956, he met two men who were stranded and needed a ride. Learning that they wanted to build a community antenna system in Paducah, Texas, he decided to raise the money for a similar system in Memphis, Texas. He sold his cattle, took out a mortgage on his home and borrowed $2500 from his father. His wife Betsy did the office work while Bob put up the wires himself. In 1962, Magness purchased Collier Electric Company, which had subscribers in Wyoming, Colorado, and Nebraska, bringing the total number of subscribers to 18,000. Over time, his company acquired more systems but remained in Bozeman. By 1965, Daniels told him the companies needed to be located in a larger city. In 1968, the companies moved to Denver and became Tele-Communications Inc.
Tele-Communications Inc. went public in 1970. At the time, it was the tenth largest cable company in the United States. By 1972, with 100,000 subscribers, Magness needed someone with more business knowledge to run the operation. He decided on John Malone, president of Jerrold Electronics, a division of General Instrument. Malone took on the bankers who wanted to call in their loans, and effectively saved the company from bankruptcy. Magness made Malone CEO but remained as chairman. By 1981, Malone had made TCI the largest cable company in the United States. Bob Magness died in November 1996, owning a 26 percent share of TCI. A funeral program, provided courtesy of Rex Porter, is available here. Text and photo: "Distinguished Alumni: Bob & Betsy Magness." Published on the SWOSU website. Accessed 17 October 2011. The Free Encyclopedia. 26 March 2011. Accessed 18 October. 2011. Philip Joseph McCabe, age 54, of Provo, Utah, passed away unexpectedly in April 2016 at his home. Originally from New Jersey, he owned S&P Trenching of Provo, a company engaged in the business of installing buried coaxial and fiber optic cables for cable television and telephone companies. The quality of his work was considered excellent; according to one client "His work was some of the best a company could ask for." McCabe is survived by his devoted wife Jeannie, six children, four sisters, and his beloved dog Toto. Published in the [Provo, Utah] Daily Herald on 04/28/2016. Additional text provided by The Old CATV Equipment Museum. Bruce Merrill, 92, passed away peacefully on Sunday, February 13, 2011. He is survived by his loving wife of nearly 70 years, "Ginny," three sons, 19 grandchildren and 25 great-grandchildren. Merrill was born in Globe, Arizona. His father passed away when he was 16 and though he was already in his second year of college, he dropped out to go to work and support his mother and several young siblings. He married Virginia Mae Walters and almost immediately left to serve five years in the Pacific Theater during WWII. Upon his return he finished his accounting degree at Arizona State University and as a CPA launched his career in the business world. Merrill built one of the first cable television systems in the country in 1950 in Globe, Arizona. He became prominent in the cable television industry, serving as the president of the National Cable Television Association, helping lead the industry through some tumultuous times into its heyday, finally selling his substantial holdings in 1983. He then launched another prominent career in the Wireless Communications Industry. Merrill was considered a great leader in everything he did and was greatly admired by his employees and colleagues over six decades of entrepreneurial activities, active until the end. Published on The Arizona Republic website. Copyright 1999-2011 Legacy.com (accessed 02/17/2011). Photo courtesy of Rex Porter. Dee Berne Merryweather, 47 of Orem [Utah] passed away unexpectedly in his home on Saturday, May 17, 2008. Dee was born May 26, 1960 in Provo, Utah to Keith and Eloise Mann Merryweather. His family was his whole world and spent most of his time with them. He enjoyed being outdoors, camping and riding four-wheelers. Dee loved NASCAR and anything to do with cars and tools. He traveled all over the U. S. working as a journeyman lineman for CATV. Dee is survived by the love of his life and mother of his children: Lisa Mayo Merryweather; two beautiful daughters: Lacey Marie and Ashley Dee Merryweather; father, Keith; siblings: Sky, Connie (Steve); Cory (Annette); Dana Lee (Brad); Sue (Memo); Chris (Tara); Endyn; in-laws: Pat (Bethany); Mike (Rhonda); Gary; Lori (Danny); Lois (Robert) and 45 nieces and nephews. He was preceded in death by his mother Eloise; brother, Scott; and sister, Jewel. Published in the [Provo, Utah] Daily Herald on 05/20/2008. Leroy Edward (L.E. "Ed") Parsons, 82, acknowledged as one of the first community antenna (CATV) operators in the country, died May 23, 1989, in Fairbanks, Alaska, following complications from surgery. Ed Parson's search for television signals in Astoria, Oregon, was for personal reasons. After seeing television in Chicago, his wife wanted "pictures with radio" when they returned home to Astoria. When what is now KING-TV in Seattle, Washington, went on the air, Ed found a way to receive it, 125 miles away in Astoria, and introduced television to his apartment on Thanksgiving Day 1948. When the word spread though the community that television was available in the city, Ed found his radio supply store connecting homes to his television antenna. Ed Parson's fame as a developer of CATV systems quickly spread throughout the northwest. He was asked to design, build, and maintain systems in the area, often making the necessary equipment or modifying equipment to meet systems needs. Overworked and exhausted, Ed was ordered by his doctor to take a rest. An excellent pilot, he flew himself to Alaska. There he became interested in aircraft radio. First as a consultant and later an employee of Wien Airlines, Parsons designed and built navigational and voice communications systems for ground-to-ground and air-to-ground communications. He constructed radio sites to make the first contact in this hemisphere with planes flying over the polar route. He trained Eskimo women to operate the transmitters, and his "Angels of the Arctic" were welcome voices to those planes coming out of lost radio contact with the ground. Parsons never returned to the lower 48 as a cable operator. However, he did establish a cable system at Point Barrow that broadcast a full day of programming recorded in the lower 48 and flown from Point Barrow for local origination. Parsons made significant contributions to what we know as the cable television industry and to aircraft navigation and communications. Usually dressed in a white shirt with necktie, with white hair topping his 6 foot frame, he was known in Alaska as "The Great White Father." Sent by Rex Porter; original source unknown. Henry Herman "Hank" Pittman, Jr., age 61, of Elledge Mill Road, North Wilkesboro, died November 24, 2009 at Wake Forest University Baptist Medical Center. He was born October 2, 1948 in Homerville, Georgia to Rev. Henry Herman Pittman, Sr. and Clara Holmes Pittman. Mr. Pittman was a US Army Veteran, serving in Vietnam. He worked 40 years as a cable TV splicer and worked all over the United States. He was a hard worker, and very dedicated to his wife and children. He was killed by a hit-and-run driver while on a night splice job in Alexander County, North Carolina, and died enroute to the hospital. The memorial service with full military rites will be at Miller Funeral Home in North Wilkesboro, NC. 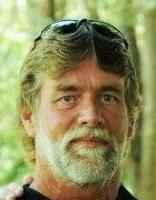 In lieu of flowers, memorials may be made to the Hank Pittman Memorial Fund for his children at any Wachovia Branch Bank. with additional information provided by Cabletv-list members. Thomas James Polis, 57 years, on Oct. 13, 2001 of Downingtown, PA; beloved husband of Carolyn Ann (nee Pechanec); devoted father of William J. Polis (Mary Anne), Thomas J. Polis, Jr.; loving son of Dorothy L. and the late Joseph B.; dearest brother of Joseph R. Polis and Toni Jill Allen; also survived by many nieces and nephews. In lieu of flowers, memorial contributions may be made in his memory to YoungLife, Bedford, P.O. Box 20464, Roanoke, VA 24018. Published in the Philadelphia Inquirer and Philadelphia Daily News from 10/15/2001 - 10/16/2001. Tom Polis was an inspirational leader and an example to all in the cable telecommunications industry for his commitment to the Society of Cable Telecommunications Engineers (SCTE) and to the industry as a whole. Tom was a cable pioneer who became very active in the SCTE. His talents, leadership and guidance as President and as a member of the Board of Directors during SCTE's early years helped the Society to survive and fulfill its mission, to provide excellence in professional development, information and standards to its members. SCTE Foundation, Tom Polis Classic Golf Tournament brochure, 2008. Ted Rogers, founder of Canada's largest cable-television and mobile-phone company and owner of the Toronto Blue Jays' baseball team, died in his Toronto home Tuesday morning [December 2, 2008], at the age of 75, the company said. Rogers, long listed as one of Canada's wealthiest people, had been hospitalized in October for an existing heart condition. Despite his failing health, Rogers continued to live up to his reputation of being a relentless businessman. "He feared dying young like his father but was consumed by work and put strain on his health, even working from the hospital bed more than once," Rogers Communications Inc. said in a statement released after his death. Bespectacled, tall and sandy-haired, Rogers was known as a workaholic, a demanding boss and a stubborn leader. Continued at Legacy.com. Copyright © 2008 The Associated Press. November 23, 2011 - Donald D. Rohn, an industry leader in communications tower manufacturing, passed away on Nov. 21 at age 72 at Riverview Manor Care in East Peoria, Illinois, where he was being treated for an injury he suffered from a fall a number of months ago. In the late, 1950s Don began working at his father Dwight's tower manufacturing plant prior to graduating with a bachelor's degree in business from the University of Illinois. Founded in 1948, Rohn's primary product line was small residential television towers. But as TVs evolved in the 1950s from utilitarian wonders to pieces of fine furniture art, coupled with speakers that were as large as the screen, the tower structures didn't change. In fact, they began to show considerable weathering as rust streaked sides of homes they were attached to. Rohn was the country's first manufacturer to see the need for galvanizing their towers and built their own galvanizing plant. The extra hot dipped galvanizing production cost paid handsome dividends for the company in a competitive market as their sales increased dramatically, requiring the company to expand to 40 employees. Retiring as Rohn's president in 1997, Don was an early advocate of climber safety and created a company culture that saw Rohn provide safety climb systems before it became an industry requirement. Born in 1939, Don was preceded in death by his parents, Dwight and Lela M. (Dodds) Rohn. Surviving are his wife, Joyce of Dunlap and three sons. A memorial service will be at 1:00 PM. Saturday, November 26, 2011. Memorials may be made to the Greater Peoria Family YMCA, 7000 N. Fleming Lane, Peoria, IL 61614, or to the Salvation Army, 414 NE Jefferson Avenue, Peoria, IL 61603. US cable pioneer Gene Schneider has passed away at age 82 in Denver, Colorado. In Europe, Schneider is best known as the founder of United Pan-Europe Communications International. Schneider was involved in the creation of Bill Daniels' first cable system in Casper, WY along with his brother Richard. He expanded this single cable system into the eighth largest cable company across the US by the 1980s. Upon merging this company with United Artists Cable, Gene Schneider created an international cable company, United Global, Inc., which was bought by Liberty Global, Inc. in 2004. He served as Founder, CEO, and Chairman of United until it was sold, and through 2008, remained on the Board of Liberty Global. By Robert Briel. Published by Broadband TV News on 08/24/2009. Cable television lost another pioneer when Ray V. Schneider died on Saturday, June 3, 1989, after a lingering lung illness. Ray and his wife Jean settled in St. Louis, Missouri, after illness forced his retirement from the industry in late 1977. After some sales work following high school, Ray, a native of the Upper Bronx ended up in Williamsport, Pennsylvania, with a college scholarship to participate in sports. That, an interesting career in military services and other jobs selling food, furnaces and automobiles placed Schneider in a position to be asked to manage a new cable system to be built in Williamsport. Williamsport was interesting because it had three separate, competing franchises and eventually became one of the "large" cities to be wired for cable as a Jerrold system. Willliamsport became a learning center for investors and operators wanting to find out how to get into cable. Ray went on to hold executive positions with Teleprompter, Meredith-Avco and Times Wire and Cable, among others. His associates include many other pioneers in the industry. He was known for his successful management style, his personal hard work, fair treatment of those who worked with him, and respect earned from many segments of the cable industry. Milton Jerrold Shapp, former Governor of Pennsylvania and a Philadelphia industrialist who was the first Jew to mount a campaign for the Presidential nomination of a major party, died on Thursday at Lankenau Hospital in Wynnewood, a suburb of Philadelphia. He was 82. Mr. Shapp, a Democrat, served as Governor from 1971 to 1979 and instituted a state income tax and lottery. He ran unsuccessfully for the Democratic nomination for President in 1976. Before he became Governor, Mr. Shapp worked on John F. Kennedy's Presidential campaign and is credited with promoting the idea that eventually led to the creation of the Peace Corps. Fresh out of the Army Signal Corps after World War II, during which he was a captain and served in North Africa, Italy and Austria, Mr. Shapp, an electrical engineer, founded the Jerrold Electronics Corporation in 1948. The company went public in 1956 and did $25 million annually in business. A decade later, when Mr. Shapp sold his interests, the corporation's business was up to $50 million a year. Born in Cleveland, Milton Jerrold Shapp attended the Cleveland public schools and earned a bachelor's degree in electrical engineering from Case Institute of Technology (now Case Western Reserve University) in 1933. He entered public life in 1960, when he became an early supporter of Mr. Kennedy. In the 1960 election, he served as chairman of the Business and Professional Committee for John Kennedy in the Mid-Atlantic States. During that campaign, Mr. Shapp suggested to Mr. Kennedy the idea of forming a Peace Corps. In a speech at Penn State University on March 9, 1961, titled "Peace and the Peace Corps," Mr. Shapp outlined for the first time the basic policies that were to serve as a guide for the operation of that organization. He returned briefly to business in mid-1963, but plunged very quickly again into politics. He made an unsuccessful bid for the Senate in 1964. After that effort failed, he worked in the campaign of Lyndon B. Johnson and organized businessmen in the East for him as he had done for President Kennedy. In his two terms as Governor, Mr. Shapp won national attention for his consumer-advocate policies and his innovative programs for elderly and handicapped people. He was largely credited with bringing Pennsylvania back from the brink of deficit. Mr. Shapp also instituted full financial disclosure for top officials, the most comprehensive of the so-called Sunshine Laws for open government in the nation and a strict code of ethics for all state employees. A violinist, Mr. Shapp made his concert debut as a soloist with the Erie Philharmonic in 1978. In an interview during his Presidential bid in 1976, he was asked why he was running. "I compare myself to the people who were talking about becoming candidates," he answered. "In knowledge of the economy, in ability to develop programs and get them implemented, and I couldn't see anybody comparable. I saw the caliber of these people and I said, 'What the hell.' "
But he withdrew in March of that year after having picked up only one delegate. He blamed a late start and "putrid" news coverage for his poor showing in a crowded field of Presidential aspirants. In a 1981 letter to The New York Times, Mr. Shapp sharply criticized President Ronald Reagan's sale of AWACS electronic-warfare planes to Saudi Arabia. "It would be far more beneficial to America's future economy and to its security if the President would implement a major civilian AWACS program by beginning a war against city slums in our nation," he wrote. "Unless we soon start to cope realistically with our major internal problems, no amount of sophisticated weapons in our possession or in the hands of so-called allies will be able to stave off internal disruption." Mr. Shapp battled Alzheimer's for several years, said Richard Gross, a family friend. He is survived by his wife, Muriel; two daughters, Dolores Graham and Joanne Shapp; a son, Richard, and three grandchildren. Keneth Alden Simons (March 10, 1913 - June 11, 2004) was an American electrical engineer best known for his pioneering contributions to the technical development of cable television in the United States, for the most part as chief engineer for the Jerrold Electronics Corporation. Jerrold was one of the first manufacturers of cable television equipment and also constructed entire cable systems. Simons designed one of the first converters and the two most important pieces of the early test equipment, the Model 704 and Model 727 Field Strength Meters, authored a seminal technical handbook on cable television systems, and served on national and international engineering standards committees. Fellow cable engineer Archer Taylor stated that Simons was seen as the leading technical expert at Jerrold for over two decades. Simons began at Jerrold Electronics Corporation as a part-time consulting engineer in 1951. His first project was to design a high-to-low frequency converter. Some of his noteworthy designs include the Model 704B Field Strength Meter. In a technology area based on rapid and constant change, the 704B was of note in being in production and use for more than 20 years The 704 name is honored even today in a fraternal organization of its users Loyal Order of the 704, commemorating the meter's defining role in cable development. Simons also designed its successor, the Model 727 Field Strength Meter; the Model 900 and Model 1015 Sweep Frequency Generators, and the Model SCA 213 Distributed Amplifier. Published in Wikipedia on 02/19/11. Accessed 02/19/11. 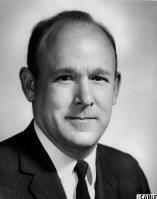 Robert Allan Spann died November 6, 2001 of complications from heart disease. He was born in 1934 in Tucson Arizona to Russell and June Spann. As a child he lived a carefree existence, roaming the deserts of Tucson looking for the troubles that young boys are apt to find. His best friend, who was also his Grandfather, guided him until his adolescence, and molded the personality and character of the young Bobby Spann. Bob graduated from Tucson High School, and pursued a degree in Engineering at the University of Arizona. In 1956 he entered the Army and served until 1960 when he was honorably discharged. After leaving the Army, Bob returned to Tucson and his job at Hughes Aircraft. In 1964 the family moved to southern California when Bob accepted job there. He later moved on to a job at Anaconda. Alter attending, classes at IC Irvine, Bob a professional designation in value analysis. In 1975 the Spann family returned to Arizona when Bob accepted a position at Gilbert Engineering. He remained with the company, seeing it grow to an industry leader in the manufacture of connectors for Cable TV. Through multiple changes in the structure of Gilbert, Bob achieved the title of President and CEO of Corning Gilbert Inc., the position he held at the time of his death. During, lifetime, Bob traveled the world, read voraciously, and pursued ever-changing interests. He was a larger-than-life character and at 6'6 that meant something. His strength of character, intelligence, and dry humor will be missed by all that knew him. He is survived by his daughters Karen and Kim, his ex-wife Marcia, numerous friends, and his second family at Corning Gilbert. In lieu of flowers, please send contributions to The Arizona-Sonora Desert. Museum, Tucson, AZ 85743. Published in the Arizona Republic, November 2001. Herbert R. Timberlake, 81, passed away Monday, June 1, 2009, from acute leukemia. Mr. Timberlake was born in Parke County, Ind., on July 8, 1927. He was a member of Eastern Hills United Methodist Church, Southside Masonic Lodge #1114, Sunrise Daylight Lodge #1433, Hemphill Heights Chapter and Council and Polytechnic Eastern Star. He was a charter member of 40 years with the SCTE Society of Cable [Telecommunications] Engineers. Survivors include his wife of almost 58 years, Betty Timberlake; sons, David Timberlake and wife, Jennie, and Robert Timberlake and wife, JoAnn; grandchildren, Laura English and Daniel Timberlake; and sisters, Ruby Good, Lucille Holloway and Matilda Lane. Published by Laurel Land Funeral Homes and Cemeteries, Fort Worth, TX, on 06/03/2009. Cable TV & Communications President John Walson Jr. has died, the Bethlehem-based company announced today. Walson, 63, son of founder John Walson Sr., died Sunday at his home in South Whitehall Township [Lehigh County, Pennsylvania] after being diagnosed with terminal cancer a few weeks ago, according to Andy Himmelwright, general manager of Service Electric Cable TV-2. Walson had been with the company for 38 years. Himmelwright credited him with continuing the vision of his father, who is credited with inventing cable television. "John really took his father's dream ... and really grew it to the next plateau," Himmelwright said. Service Electric got its start in 1948 Mahanoy City, a Schuylkill County town surrounded by mountains. Walson Sr. built a line from an antenna tower atop the mountains — the only way to get television in town — to his appliance warehouse, creating the first community antenna television system, according to the company's website. Walson Sr.'s efforts were formally recognized by the U.S. Congress and the National Cable Television Association in 1979. Prior to becoming president, Walson Jr. had spent a number of years in the company's field operations, including ten years as a headend technician, tne years as a field technician, and six years as a chief engineer for the company's TV studio. By Lynn Olanoff, The Express-Times, Lighigh Valley, Pennsylvania. Posted on lehighvalleylive.com on August 22, 2012. Reproduced by permission. John Walson Sr. (1915-1993), from Mahanoy City, Pennsylvania, is recognized by the U.S. Congress and the National Cable Television Association as having invented cable TV in the spring of 1948. Walson, owner of a Mahanoy City appliance store, needed to solve problems receiving signals from Philadelphia television stations, which were blocked by the mountains surrounding the town. Walson erected an antenna on a utility pole on a local mountaintop that enabled him to demonstrate the televisions in his store with strong broadcasts coming from the three Philadelphia stations. He connected the antenna to his appliance store via a cable and modified signal boosters. He then connected several of his customers who were located along the cable path. This was the first community antenna television (CATV) system in the United States. Walson's company grew over the years, and he is recognized as the founder of the cable television industry. He was also the first cable operator to use microwave to import distant television stations, the first to use coaxial cable to improve picture quality, and the first to distribute pay television programming. His descendants now own Service Electric, which is a family-owned cable TV provider serving Pennsylvania and Northwestern New Jersey. Published on Wikipedia on 11/21/2010. During the last 40 years of his life, Mr. Walson served as a director of the National Cable Television Association, the Pennsylvania Cable Television Association, and numerous other civic organizations. In 1993, he was inducted into the Broadcasting and Cable Hall of Fame. Mr. Walson passed away on March 28, 1993. Published on The Cable Center website, n.d.
David Lee Willis, of Lone Tree, Colorado, died peacefully July 4, 2009. David is survived by his wife, Phyllis, his children, Kelly, Randy and Todd, and six grandchildren, who will all miss him dearly. Published on the Denver Post Obituaries website on 07/07/2009. My friendship with Dave goes back to the days when I ran an MSO in Kansas City and Dave engineered cable systems in Nebraska. Later, Dave would move with TCI to the Denver headquarters and become TCI's Director of Engineering. By that time, we had sold the MSO and I had gone to work for Times Wire and Cable Company, working out of the Jerrold office in Kansas City. I still owned cable systems and would call on Dave for engineering help especially since he was very knowledgeable about the loading of cable spans, sag requirements and other construction formulae. He never ducked my call. Later I would call on him selling cable from Time and then connectors from Gilbert Engineering. While I was Editor-In-Chief of Communications Technology magazine, Marlowe Froke was the President of The Cable Center and worked out of a temporary office on the campus of the University of Denver. I sat on the early board of The Center and Marlowe asked if I would volunteer to handle the mass shipments of vintage equipment that had been delivered from the cable TV museum at Pennsylvania State University to DU by Frank Drendel's Comm-Scope fleet. I didn't have the time but said I would ask if Dave Willis would volunteer. b Dave did so willingly and I have photos of Marlowe and me with Dave going over the old gear which was stored at that that in a warehouse on Colorado Blvd. Dave Willis was the logical choice although we did have to work to keep him from tearing into the gear in an effort to make it work. By Rex Porter. Published on Cabletv-list on 07/05/2009. Wendell Woody was born in Albany, Missouri, where his career in electronics began at age 9 when he commenced repairing radios in his father�s plumbing shop. He utilized the schematics printed by Howard Sams as well as technical advice from the small town�s electrician to enhance his natural ability to fix things. Television became available to consumers in 1952. Wendell and his father purchased an Admiral TV set which was placed in the plumbing store's front window. Reception was very poor; often the street onlookers could see only a test pattern. Wendell graduated from the University of Colorado, and went to work for a Denver electronics wholesale company. There he developed a friendship with Bob Snider, a Jerrold vendor. Wendell soon joined Jerrold where he held various managerial and marketing positions with for 18 years. He later served CATEL as National Director of Sales and was a Senior Vice President for ANTEC (Anixter Cable TV). He joined SPRINT in 1993, serving as Executive Director, Cable Television Sales. He retired from Sprint in 2001 and formed his consulting company, Wendell Woody & Associates. He specialized in EAS and worked with Monroe Electronics in planning systems for cable owners. He maintained this position until his death in 2015. Continued here. Unpublished remembrance by Mrs. Wendell (Ruth) Woody, July 2016. From the BROADBAND LIBRARY, Summer, 2015. The Cable Industry is grieving and it's important you understand why. A beloved and dedicated member of our SCTE family has left us. Wendell Woody, a.k.a. "Woody" passed away April 8, 2015 at the age of 80. He battled a respiratory illness to the and even though he was too sick to travel he did so anyway to attend SCTE Cable-Tec Expo 2014 in Denver. He was accompanied to the Show by his wife of 60 years, Ruth. Continued here, page 3. Unpublished remembrance by Kathy Wilson, July 2016. SCTE mourns the passing on July 10, 2006, of John Daniel Zimmerman, an SCTE Charter Member, after and extending illness. (SCTE was established in 1969.) He was 77. Mr. Zimmerman, of Six Mile Run, PA, was the owner of Zimmerman's Electronics, which he started as a radio and television repair business in 1951 after earning a bachelor of Science in mathematics and Juniata College, which is located in Huntingdon, PA.
"My father will be sadly missed by family, friends, and business colleagues as pioneers, visionaries and hard workers will always be missed as they pass from this life," said Mr. Zimmerman's son, John Mark Zimmerman, who from age 5 worked alongside his dad in the business and later became his father's business partner. The late Mr. Zimmerman broadened his business and developed and owned cable networks that his son said were literally "built one customer at a time. " Added John Mark, "In those early days of cable television, many RF distribution components were not readily available off the shelf or too expensive to buy and had to be built by hand." In 1989, Mr. Zimmerman sold his company's cable holdings, which, via Adelphia, nowadays belong to Comcast.